West Ham boss Alan Pardew has hit out at Arsene Wenger for not fielding an English player in Arsenal's Champions League win against Real Madrid. "I saw a headline saying Arsenal are flying the flag for Britain," he said. "I kind of wondered where that British involvement actually was when I looked at their team. "It's important that top clubs don't lose sight of the fact that it's the English Premier League and English players should be involved." 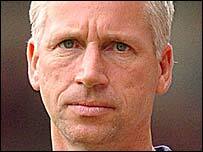 Pardew added: "Foreign players have been fantastic. We have learned from them and from foreign coaches. "But, to some extent, we could lose the soul of British football - the English player. "We have a young team at West Ham and we are proud we have so many Englishmen. "The soul of this team will remain with at least three or four English players as long as I am West Ham. I think that's important, I really do." Professional Footballers' Association chief executive Gordon Taylor said: "It's an English club but not an English success, it's probably a greater reflection of youngsters from France and elsewhere in Europe. "It's hard to say that it speaks volumes for English football when none of the players are homegrown." Taylor said of Arsenal's victory against Real Madrid: "It's tinged with disappointment. Arsene Wenger chooses the team and has got them through and the quality is there for all to see. "However, it would be more enjoyable if we saw Ashley Cole and Sol Campbell as part of it. "It's a bit odd to look for the silver lining being England's players being fresh for the World Cup."